Free standing air conditioner: is it a good investment? • The Air Geeks, reviews of air conditioners, dehumidifiers and air purifiers. Blog, Portable Air Conditioners » Free standing air conditioner: is it a good investment? Free standing air conditioner: is it a good investment? Who likes to live in sweltering heat in the summer? Nobody, that’s for sure! Air conditioning was invented so that everyone can be comfortable in summer. Inventors have gone even further by creating free standing air conditioners. Well, let’s cut it: A free standing air conditioner is a good investment, but as is current in home devices, the answer has more to do with lifetime cost of the unit (to install, to operate, to service), than a one-time buy. At the Air Geeks, we have found that this long-term view is the only valid one! There’s not really any work to do; you just plug it into a mains socket, adjust the settings and the system will quickly cool the room. Most non-free standing ac unit require a professional to install, which has to be factored into the price! So, you don’t need to shell out money for experts to install it, or dig any holes in your walls (with a drill) to get some cool air at home. It goes without saying that you’ll save on installation costs. With its minimalist, streamlined design, mobile air conditioners are very easy to maintain . You just need to give it an occasional wipe with a clean cloth and place the hose near or a door or window to evacuate the hot air. In addition, some models are self-cleaning, so will save you considerable time. You won’t need to call out a professional cleaner because it is easy to do it yourself. If you opt for a simple model, you can easily store it away at the end of summer and it will take up very little space. Compared to other air conditioner models, free standing air conditioners are very economical and we can even say that they are among the cheapest models on the market. 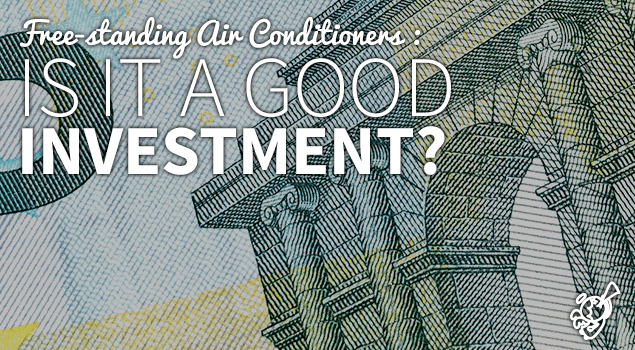 So, by opting for mobile air conditioning, you’ll definitely make savings. Not only will you save on the purchase price, but the fact that you won’t need anyone to help with installation and maintenance means that you make big savings in that area too! Look for units with the Energy Star rating logo : you will save in electricity costs. You’ll save even more if you opt for an air conditioner that is not very energy intensive (Energy Star rating), and reversible mobile air conditioning can also provide heating in winter. There’s a wide selection of mobile and reversible air conditioning on the market. Mobile air conditioning is a good investment despite the fact that it is an extra air conditioning unit that can only cool one room at a time. If you opt for a reversible model, you could even save more money. Now all you need to do is find out how to choose a free standing air conditioner that will give you the results you need.